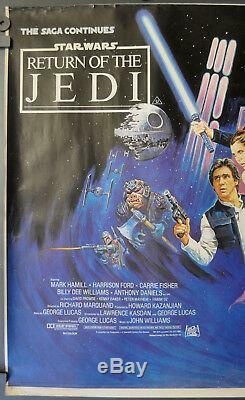 AUTHENTIC & RARE 30" X 40" ROLLED BRITISH QUAD POSTER FOR THE MOVIE. 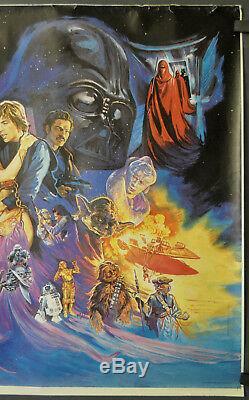 STAR WARS, RETURN OF THE JEDI. HARRISON FORD, MARK HAMILL, CARRIE FISHER. A " RE-PRINT " OR A " REPRODUCTION " OR A " PRINT ". THIS IS AN ORIGINAL POSTER PRODUCED BY AND DISTRIBUTED BY THE STUDIO IN CONJUNCTION OF THE FILM BEING SHOWN IN THE THEATERS. THE UNIQUE ASPECT OF THIS POSTER IS THAT THIS POSTER MEASURES 31" X 41" DUE TO THE FACT THAT THE PRINTER DID NOT CUT THE POSTER AS IT SHOULD HAVE AT THE PRINTER MARKINGS THUS THE POSTER IS LARGER THAN THE 30" X 40" IT SHOULD HAVE BEEN. NOTE: AT TOP EDGE LIGHT EDGE WEAR APX. 6 IN LEFT AND APX. TWO 1" EDGE TEARS AND FOUR 1/2" EDGE TEAR ALONG TOP. NOTE: UNLESS OTHERWISE STATED, THESE ARE ORIGINALS. THIS MATERIAL WAS USED FOR MARKETING PURPOSES. DUE TO THE FACT THAT THESE MATERIALS ARE OLD AND CAME TO US VIA THE STUDIOS, OR OTHER SOURCES INVOLVED WITH THE FILM INDUSTRY, THEY ARE NOT EXPECTED TO BE IN ABSOLUTE MINT/UNUSED CONDITION. ANY GLARE SEEN IN THE IMAGE IS DUE TO THE CAMERA ANGLE AND NOT A DEFECT IN THE POSTER. 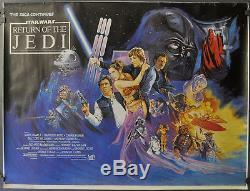 TO THOSE READING OUR POSTINGS, WE SELL ONLY ORIGINAL MOVIE POSTERS AND MOVIE RELATED MATERIAL. WE WILL NEVER SELL REPRODUCTIONS OR FAKES. 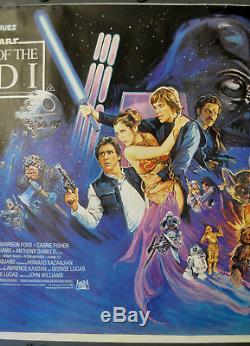 The item "STAR WARS RETURN OF THE JEDI 1983 ORIG 30X40 ROLLED QUAD MOVIE POSTER" is in sale since Monday, October 1, 2018. This item is in the category "Entertainment Memorabilia\Movie Memorabilia\Posters\Originals-United States\1980-89".